Bodies of Water: Age of Fluidity questions the relationship between the human and the non-human; from the organic to the technological. Rowan analyses ideas of water, time, ecology and the ephemeral through a vast array of materials and components, including natural or fabricated materials, along with everyday objects. The exhibition explores these ideas through utilising notions of circulation, change and becoming. Through the natural and physical processes of the transforming states of materials; such as melting ice, running water, oxidising copper and crystallizing salt. Rowan highlights a material’s specific relationship to time, with different materials and processes having unique timescales. Within the exhibition the various parts and elements of the installation are interconnected via countless pipes and tubes. The installation becomes a circulatory system, akin to veins and arteries in a body. This circulatory system connects the synthetic elements and natural materials which meet and merge into one. Rowan looks at how these inanimate objects might relate to the animate or ogranism. Her installations can be thought of as ecologies of assembled materials, including technology and information. They are precarious systems in the state of entropy mirroring our own global ecology. 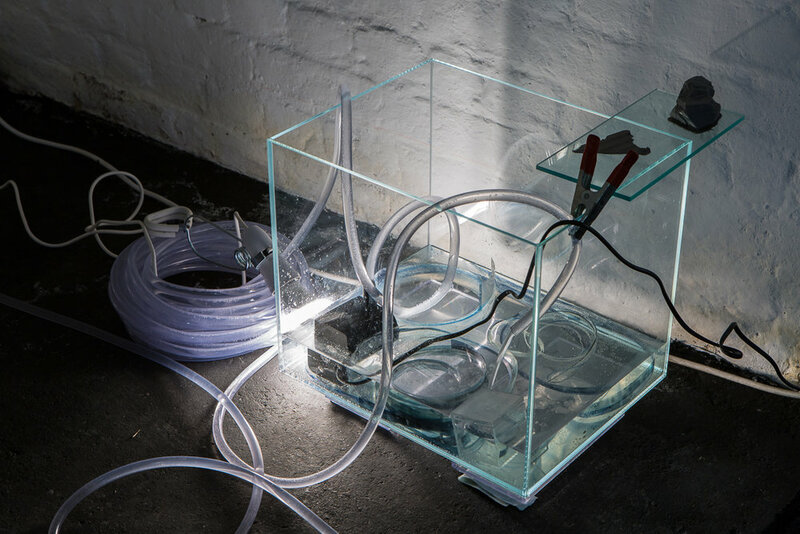 Rowan challenges the concept of the isolated self in these watery systems. Writing about the implications of thinking about water in relation to the philosophy of the self, Astrida Neimanis has stated: ‘As watery, we experience ourselves less as isolated entities, and more oceanic eddies...Dietics falter. Our comfortable categories begin to erode’1. Indeed, as part of a global community, human and non-human, our current position is determined by an increasing state of liquid fluidity that stretches across the physical and the virtual terrain, the earth and the screen. Rowan’s work embodies this deep sense of interconnection. As the temperature of our planet rises, ice caps fracture, drift apart and melt away into rising sea levels. 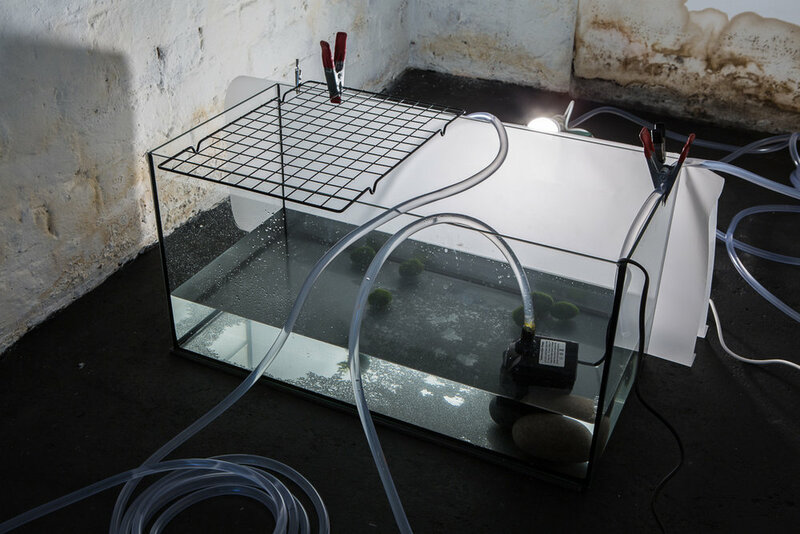 Rowan’s practice explores the acceleration of ecological dissolution due to human activity and its relationship to technology. In the exhibition, an ice rock gradually melts. The droplets, like a ticking clock, serve as a memento mori that point to an inescapable reality and our responsibility in this interconnected world to address these environmental threats. Hannah Rowan (b. 1990) lives and works in London. 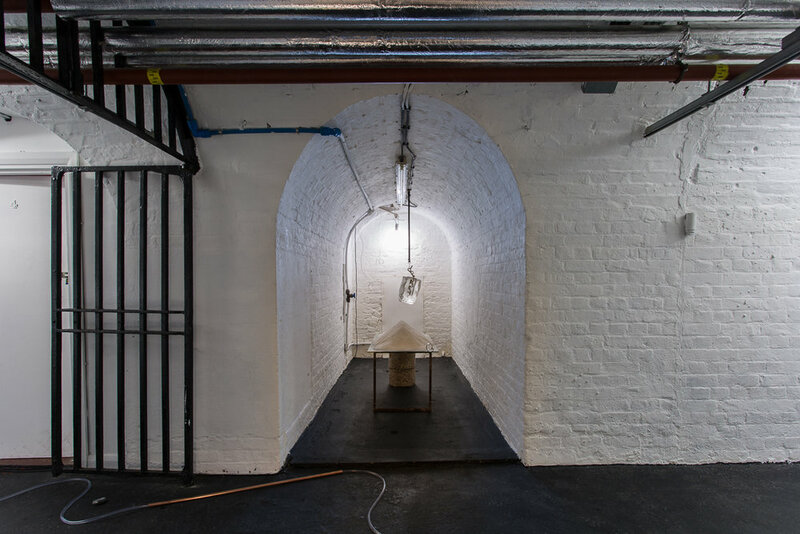 Recent exhibitions include: RUST: Art Licks Weekend Peripheries 2018, curated by Muddy Yard, The Icing Room, London, UK; Every Thing, Assembly Point, London, UK; Wild Within, Curated by La Wayaka Current, Guest Projects, London, UK; Plane of Imminence, Safehouse Gallery, London, UK; Too Much Information, Seventeen Gallery, London, UK; Perpetual Inventory Vol.3, Filet, London, UK; Situation 3, Here at 26b, London, UK; Critical Cartographies, Filet, London, UK (all 2018). Forthcoming exhibitions include: Oikos Logos, Enclave Lab, curated by William Noel Clarke, London, UK; Solo Exhibition, Assembly Point, London.